Dan Santat is the author and illustrator of many books, including The Guild of Geniuses and Sidekicks. He won a Caldecott Medal for his book The Adventures of Beekle. www.dantat.com. "The only bump in the road for this turbo charged tribute to girl power is the dilemma that libraries will face in having to choose between the equally compelling jacket and covers. Best-selling Angelberger and Caledecott-winner Santat are proven successes, and this high-energy, girl-powered tale will zoom right off shelves." "Rocket-fueled panel artwork by Santat (After the Fall) gleams like carbon fiber. His rendering of Angleberger’s (the Origami Yoda series) inspired injection of sports-network energy into fairyland produces a shot of gleeful adrenaline whose only fault, like the best of things, is that it’s over too soon." "Rev those engines and buckle that seat belt—readers are in for a bumpy ride. A high-octane storytime selection." "The full-page illustrations are saturated with color and express the action so vividly readers will nearly hear the roar of the racetrack. The emphasis on the Princess' racing skill and zeal for her sport is empowering and refreshing." "Santat’s vibrant illustrations come so alive that readers can practically hear the squealing tires and the roar of the crowd." 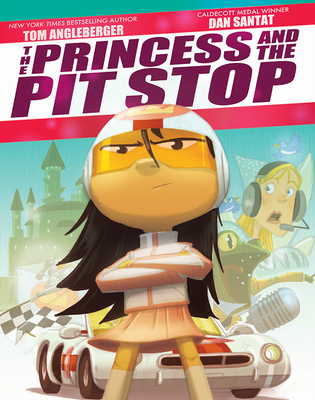 "With its breakneck speed and massive number of storybook references, The Princess and the Pit Stop is sure to be a story time favorite." "This speedy freshening up of classic characters from children’s literature honors the power of confidence and determination and puts the Princessin the driver’s seat."